If you are given any specific instructions by a health care provider follow them. Keep your wound clean and dry. Be aware that some wounds are best left uncovered. After 24 hours you can shower but never allow your wound to remain saturated with water for more than a few minutes by doing dishes or soaking in a tub or pool. If your wound has been closed using medical glue please see the section below about medical glue. Wounds closed with it require special care. Every day after the first 24 hours, remove the dressing or bandaid if you are using one. Flush the wound with clean water to rinse off any material. If it appears goopy or crusty or there is left over antibiotic ointment still clinging to the wound you can cleanse it gently using gauze with hydrogen peroxide. Apply antibiotic ointment to the wound and if using bandaids apply the bandaid. 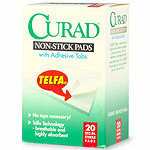 If using a bigger dressing apply a telfa pad on top of the antibiotic ointment, cover with a piece or two of gauze and wrap or tape it in place. Some wounds are better left uncovered. Follow the instructions from your health care provider. NEVER put gauze directly on an open wound as a dressing. Always cover the wound with telfa and antibiotic ointment below the gauze. The rough mesh of the gauze sticks to the wound and can even have the skin grow into it making dressing changes very painful and bloody. It will also rip off healing cells with each dressing change delaying wound healing. If you develop any of these signs please seek re-evaluation to be sure your wound is not getting infected. If you are given specific instructions by your healthcare provider follow them. Perform daily care as above but always be careful to never rub or scrape stitches or staples. Instead gently dab them when cleaning the wound. Steri-strips are small adhesive strips which hold a wound together while it heals. They will usually fall off in 4-7 days. You should trim the edges with scissors if they detach and curl up. Follow the daily wound care instructions above except avoid using water or hydrogen peroxide on the wound unless it is really necessary. the adhesive film will slough off the skin in 5-10 days.